One of the things I mentioned recently was a glut of extra produce we’ve had in the garden this year. It has been the first year we’ve grown more than a few tomato plants and a few bits n bobs, so we were (still are) complete novices about how much different plants grow and produce. I guess some of it depends on technical things like soil conditions and weather, etc, but we have learned quite a bit this year about different vegetables in particular – and we’ve also had to work out what to do with what we’ve grown! Personally, I’m originally a “Yorkshire lass” – and do try to stick to those values as much as possible, mainly because they make sense to me .. primarily to try to be canny with my money and not to waste stuff. That has lead us to trying lots of new recipes and spending hours researching what we could do with all this extra food. Chutney is one of the main things with a lot of stuff, and so far we’ve made three different types – green bean, green tomato and beetroot. They all have different things going for them and all have distinctive flavours and textures .. but currently my favourite (perhaps because I only just made it yesterday!) is the beetroot one. As far as time taken is concerned .. it takes less time than green tomato chutney (last time I made that it was a whole day job! ), but more than the bean relish (about an hour, including preparation). In a preserving pan or your largest saucepan, mix together all the ingredients well. 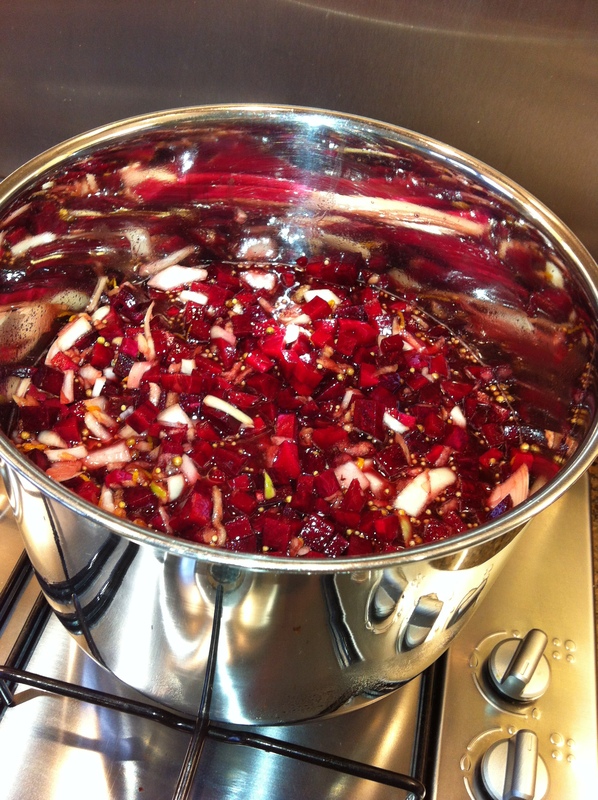 Bring to a gentle simmer, then cook for 1 hr, stirring occasionally, until the chutney is thick and the beetroot tender. While the chutney is cooking, prepare your jars by running through a short hot wash in your dishwasher. Or wash thoroughly by hand, then put in a hot oven to sterilise for 10-15 mins. Once the chutney is ready, let it settle for 10 mins, then carefully spoon into the jars and seal while still hot. You can eat it straight away but it will be even better after a month. Will keep for up to 6 months in a cool dark place. Once opened, refrigerate and eat within 2 months. A few tips that may be of some use … remember to cube the beetroot into “chutney” size chunks; I’m really not very glove friendly, so I simply used some barrier cream on my hands (and allowed to be absorbed) before chopping. It didn’t stop my hands getting coloured completely, but it certainly prevented the worst of it and, less than a day on, there is no sign of any staining left. 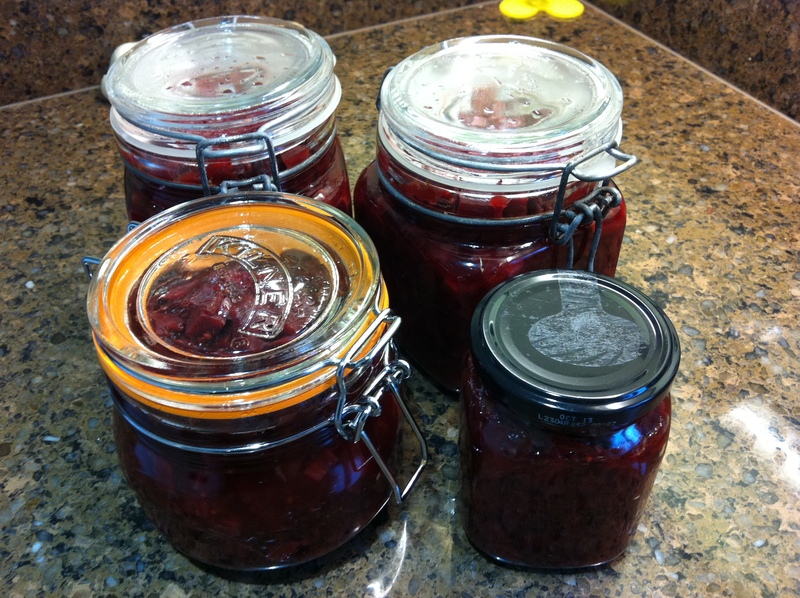 This entry was posted in "Me" Stuff, Chutney/Relish, Food and tagged beetroot chutney, chutney, recipe by Sprowt. Bookmark the permalink. That sounds delicious. I may have to “borrow” some beetroot from my Mother-in-law and dye my kitchen pink. It is lovely. Even if it weren’t, it’s almost worth making it just for the smell of it cooking! The only problem I’m having at the moment is a lack of jars .. I’ve already got a cupboard full of green tomato chutney and green bean relish (which is lush and in high demand) .. I’m running out of space! That does look rather yum! I don’t eat a lot of chutney – in fact I don’t think I ever do – but that’s just a cultural thing I think. Perhaps I should venture outside my food comfort zone and try it.